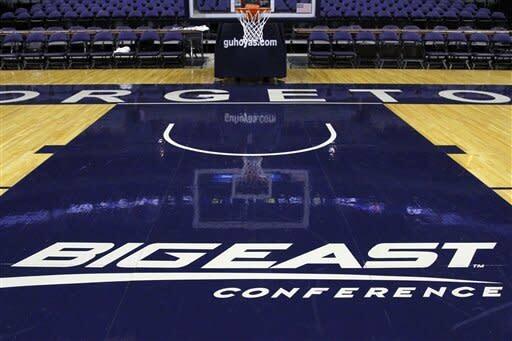 The split of the Big East Conference should soon become official. Seven Catholic schools will get the name, history and contract to stage the conference's basketball tournament in Madison Square Garden. The schools that also play football, of which only Connecticut is a founding member, will get some $100 million and a new league, perhaps named the America 12. Couple that with this year's departure of mainstays Syracuse, Pittsburgh and Notre Dame (to the ACC) and next year of geographic fit Rutgers (to the Big Ten), and there are plenty of deep sighs and sure to come sepia-toned essays about how next week is the last of the true Big East basketball tournaments, lots of Louie (Carnesecca) and Big John (Thompson) kind of stuff. Everyone will say how it'll never be the same. And it won't, of course. Except, in a different way, it could be just as good. The Big East might no longer be the top basketball conference in the country – it'll lack some powerhouse programs – but it'll still be very good, even capable of being great. And, I believe, it will continue to stage the nation's best conference tournament and one of the great events on the sports calendar. Biased? Sure, you bet. It's an event I've loved since watching on television as a kid, a feeling cemented in covering maybe a dozen of the tournaments as a sports writer. I've also been to most of the other conference tournaments though, from one-bid free-for-alls to the major, football-first leagues, and none of them compare – no matter the level of play in a given year. The Big East tournament isn't like every other tournament, the vast majority of which serve as made-for-TV money grabs that are often sporadically attended, moderately coveted (teams secure in their NCAA fate lose and shrug it off) and seemingly always in search of a new city that will perhaps draw in a couple more ticket buyers. The ACC, for instance, was once both the original and best because the NCAA tournament allowed just one team per conference. Winning the ACC tournament was a near life-and-death struggle. Those David Thompson days are long gone, though. Expansion has diluted the ACC tournament's Tobacco Road roots, and moving it around has killed tradition. It's now just another thing. The Big East is the Big East. Maybe you have to experience it to fully comprehend, but this is the perfection of the conference tournament, nirvana for the hoops obsessed. You can run your KenPom.com ratings all day and say this tournament or that bracket has better teams now and certainly will in the future, but you'd be completely missing the point. There is an ethos to the Big East tournament, one that the other leagues have forever failed to duplicate. First, it's important. It's actually beyond important. Maybe it's the Garden, the world's most famous arena, with the trains rumbling below, the cabs lined up in front, the old iron-gated service elevator taking you to court level, an entire atmosphere that has drawn the best out of Jordan and LeBron and Kobe, let alone any sophomore from Villanova. Maybe it's the proximity – so many players with New York ties, so many schools so close to each other, so many friends and rivals from high school on the other teams. The participants desperately, desperately want to win this tournament, a sort-of neighborhood shootout in the middle of Manhattan, the magnitude of the moment clear to everyone. In 2009 Syracuse and Connecticut played a six-overtime classic in the quarterfinals. Syracuse won. UConn coach Jim Calhoun was enraged at the defeat, even if it meant nothing to the Huskies' tourney prospects (they'd reach the Final Four anyway). Calhoun brushed past Jim Boeheim in the handshake line and later refused to play along with reporters trying to celebrate this momentous night. In classic, telling form, he said he saw no positives, instead lamenting his team's mistakes. "It's a loss," Calhoun snapped at a news conference well after 2 a.m. "… I could practice right now. Foul shooting, probably." That's the Big East tournament. No one who loves this event wants to see some of these schools – most notably Syracuse and UConn – leave. It's a loss. It's a big loss for everyone. What remains, though, are seven basketball-focused schools. Butler and Xavier and maybe some others will soon join. They'll only make things better. They're places with a passion for basketball, schools that fit and have fans that won't bring football recruiting talk to the MSG beer line. College sports in general, and college hoops in particular, are under assault by the people who run them. Those people care about football first and – essentially – only. You can't fault them for that. Football is the sport that makes, by far, the most money. Yet basketball and every other sport suffer because of that. If the NFL owned the NBA, Roger Goodell and his franchise owners would look at their basketball teams and the paltry – compared to the NFL – revenues as a nice spinoff but hardly a priority. Every decision would be based on football. If you own the Dallas Cowboys (Forbes value: $2.1 billion), then the Dallas Mavericks ($438 million) only matter so much. Compounding the problem, college athletics has transformed into a soulless, spreadsheet-driven business. It's almost all lawyers and MBAs running the show, getting bottom-line-motivated school presidents to rubber-stamp anything. Concerns about tradition or convenience or even the quality of the experience provided to the consumer are overwhelmed by the revenue projections. The Big Ten, for instance, keeps expanding, making itself weaker competitively and less familiar culturally. It's no longer an athletic league with a cable TV network but a cable TV network with an athletic league. Tier-one subscription fees are paramount. Everything else is ancillary. The Big East is splitting up because of all of this nonsense and its own terrible decisions. It was its own worst enemy, as bad as the rest. Yet through it all, somehow, someway, the Big East tournament was able to be about the product not the profits. This is one of the rare throwback events of college sports, unique like Pasadena or the College World Series. Students at the majority of the schools will still be able to grab a train near campus and roll right into Penn Station, head up the escalators and stand in the middle of it all. The soul of the event, the heart of the event, will not just remain but perhaps even be enhanced by this return to its roots. It's the proper recalibration and a far superior option to bringing in schools from Texas and Florida and hoping they'll adapt. It's why, unlike other leagues, the excitement, atmosphere and intensity of the Big East tourney isn't reliant on the number of highly ranked teams or whether certain rivals meet. The event stands on its own. The Hall of Fame coaches and the remarkable performances – from Pearl Washington to Chris Mullin to Patrick Ewing to Allen Iverson to Gerry McNamara – come, go and are toasted. The tourney churns on, though, always delivering. It's what Boston College wishes it never lost, what West Virginia will miss desperately this year and what Syracuse, Notre Dame and the others know, deep down, that Greensboro or wherever can never match. They can leave for supposedly greener pastures, but they'll miss those city sidewalks. The Big East tournament is the feeling that players get when they step onto the floor, especially in those electric weekend night sessions, just a block and a half off Broadway, when maybe Bill Clinton or Spike Lee or Denzel Washington arrives courtside. The Big East tournament is a row of Wall Street guys sneaking away for an afternoon session, dressed in $1,000 suits as they slam drinks and berate some official that dared to make the wrong call on the Hoyas. The Big East tournament is the throngs of twenty-something alums who have moved to the city, live in the neighborhood, and rush across 31st Street between sessions to the Blarney Stone or the Irish Times or Jimmy's BBQ for drinks and food, taking the opportunity to act up with their college buddies again or maybe to run into that girl they should've asked out back in the day. It's as close as spring break ever comes to Midtown Manhattan. The Big East tournament is the vast assortment of former players, playground legends, AAU coaches, agents, runners for agents, NBA executives, sneaker reps, high school coaches, hangers-on and Brooklyn accents that fill the seats. This is the grassroots scene the NCAA would prefer you didn't notice but everyone in the game recognizes as the engine of the sport. 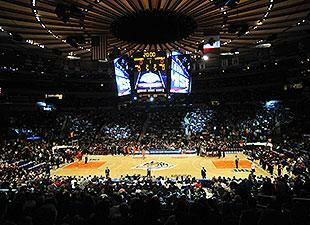 New York likes to believe it is the Mecca for the game and the Big East tournament is its annual convention. Everybody who is everybody is there, swapping gossip, lies and occasional angry glares. They're surrounded by these packs of old guys who simply love the game, who come every year to take in every minute of the action, relive the old days and argue, forever, about some call in a 1958 Bishop Laughlin-Fordham Prep contest. It is that crowd, even more than the celebs, that helps make this the grandest stage for so many players. These are their people, and to perform accordingly here can make you a legend. "It's the best tournament in the country," now-graduated Syracuse guard Scoop Jardine said last year. "It's New York City. It's Madison Square Garden. It's the Mecca of basketball. It's a great atmosphere. "That's one of the main reasons I went to Syracuse, to play in the Big East tournament," the Philadelphia native continued. "I do feel bad for (future Syracuse players who won't experience it.)" Maybe, most of all, the Big East tournament is about the honesty. This might be the most honest event in college sports. It isn't freshly scrubbed. It isn't pretending to be what it isn't. MSG smells like stale beer. The locker rooms are small, the back hallways crowded and concrete. The crowd isn't particularly collegiate. Almost everyone and everything is tied to a city, not some bucolic campus. It isn't trying to be cute. This is basketball. And if you're willing to celebrate true college basketball, the real deal in all its terrible beauty, well, it's some AAU guy in a massively expensive courtside seat seated in front of someone who is cheering the point spread, not the outcome. Yes, gambling. Did we mention gambling? The Big East tournament is also about the gambling, which isn't legal but is about as prevalent and obvious as anywhere in college sports – even all those tourneys actually held in Vegas. You want a Big East moment, the kind that you can't get elsewhere and will always get here? Consider the 2012 tournament, a late-night quarterfinal between Notre Dame and South Florida. Even with the Manhattan nightlife calling, there was still a sizeable crowd, many fans clearly with money on the Fighting Irish, who were giving three points. The last game of the night is where the money is made, the winnings being ridden, the losses potentially dug out from. This one was a roller coaster. First, Notre Dame looked ready to lose outright in regulation. Then the Irish forced overtime to warm spirits. That soon fell apart, though, as the Irish clung to a two-point lead, South Florida ball with 2.5 seconds left. The only out for a gambler was USF tying the game and forcing a second overtime. A desperation 3-point attempt – the most likely play – would either give them a one-point win or two-point loss – neither of which did much for the many riding the Irish minus-three. USF made a long in-bound pass, however, that wound up out of bounds. Many groaned. ND could just kill the clock and win the game but not cover. Hope was about lost when the Irish inbounded to Pat Connaughton, who was promptly fouled … with one-tenth of a second left on the clock. Officially, the game was essentially over. Whether Connaughton hit his free throws or not, NCAA rules state there was no way USF could even attempt another shot in one-tenth of a second. The fans, with the spread on the line, however, saw their chance at salvation and began cheering for Connaughton to make the free throws. He stepped up and nailed the first for the push. The place screamed. Then he hit the second to deliver the 57-53 final, and here came the roar, a most ridiculously loud roar for a completely meaningless free throw. Well past midnight, many in the delighted crowd headed into the New York night as winners. Even conference administrators were shaking their heads and laughing. Because that's the Big East tournament. And that, I believe, isn't going to change, not anytime soon at least.